The graduation ceremony of the Graduate Studies Program (Global Political Economy) of the Department of Political Science and International Relations of the University of Peloponnese and the Department of Economics & Business of Neapolis University in Cyprus, took place yesterday, at the University of Peloponnese. 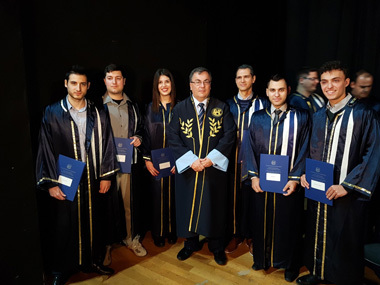 The Rector of Neapolis University, Prof. Pantelis Sklias, awarded the postgraduate degrees to the graduates. The program covers three main specializations: international entrepreneurship, international security and international development. The Rector of Neapolis, at the end of the graduation ceremony, stressed that the University will continue its outward-oriented policy in the context of collaborations with other higher educational institutions and that other international collaborations with highly important university institutes abroad will be developed.